The screen shot above shows a service record example for CloudFlare.com. Most of the fields in this dialog are self explanatory, but a few require brief explanations. Account Email: This is the email address you provided when you registered at CloudFlare. API Key: The API key assigned to you by CloudFlare when you registered. Follow these steps to locate it. Login at CloudFlare.com using your credentials. At the upper-right corner of the browser window, pull-down the menu located at your email address, and select "My Profile". Scroll-down to the "API Key" section, locate the "Global API Key" row, and select the "View API Key" button. 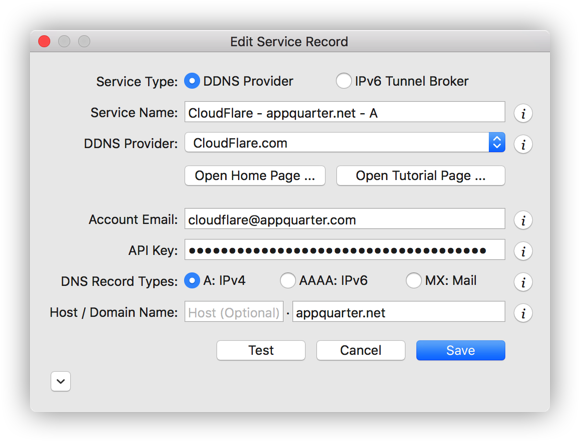 DNS Record Types: CloudFlare supports dynamic DNS records of type A, AAAA and MX.